Overview of my year: My botanical art program at Brushwood Center, my exciting new scarf project, teachings at other venues, exhibitions, and my painting projects. 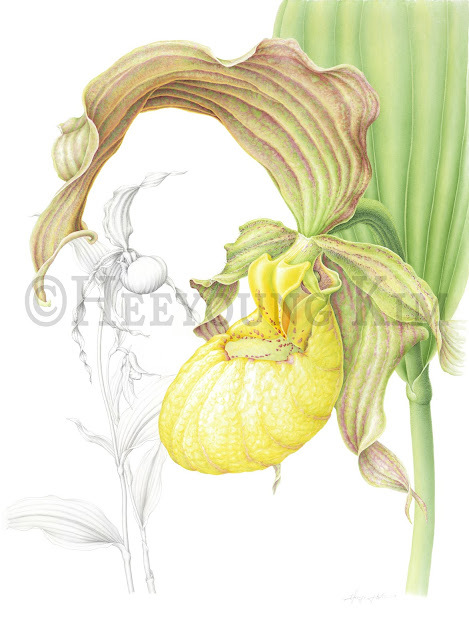 My classes at Brushwood Center has been growing steadily, and I scheduled 3 ongoing botanical art classes this year. Mondays: Intensive workshop, intermediate/advanced level, mostly watercolor. Some students focus on their own projects with various media. Saturday mornings: Half day workshop, beginning/intermediate level, similar to Monday workshop. 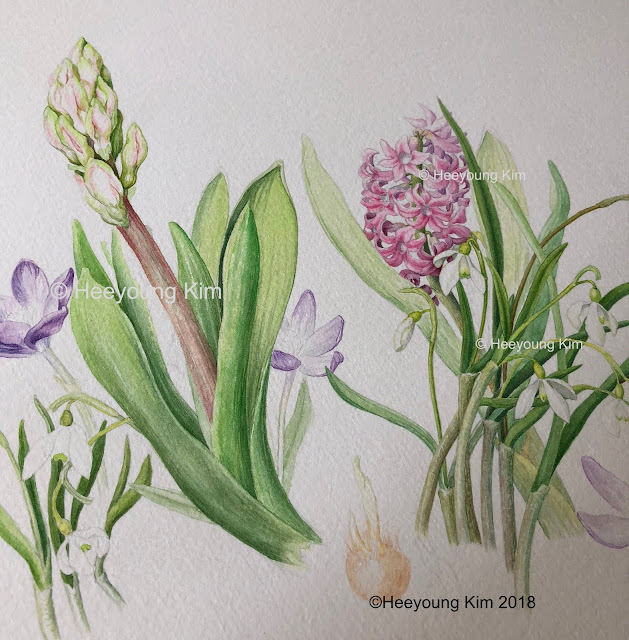 Saturday afternoon: Botanical Art Classes for Beginners: this is new in order to provide basic drawing lessons to who want to join the group. The classes include drawing and watercolor lessons. Colored pencil classes: April 7 & 14: there are strong demands for colored pencil, so I squeezed in two sessions between drawing classes, they are sold out! There might be continued sessions after this. So, stay tune if you are interested. This is a new adventure to me! But I am really loving it! I am so proud of that the first two designs were very well received. Soon, probably at the end of Aril, two more designs will arrive. Check it out my website www.heeyoungkim.net. One of them is still there, the other is sold out. I will announce when I have them in stock. Chicago Public Library: Budlong Woods, May 1 - May 31, 2018: I find public library is a great venue to show artworks to 'a lot' of audience. This time, it is a window display, so I am going to show framed Giclees instead of originals. Fermi Lab Gallery, Batavia, IL, July-September (date will be determined): this exhibit will be a group show showcasing artworks about prairies with various genres and media. I will show six framed Giclees of prairie plant paintings. 4th Annual: Heeyoung Kim and Students, Brushwood Center, Riverwoods (Deerfields), IL, November-December, 2018. Painting Orchids: I am still adding more paintings to my orchid painting project. There will be an exhibit with the orchid paintings sometime next year. Busy..... I hope I can get access to a few more 'painting worthy' orchids this year. Small Paintings of Seasonal Flowers: This series was inspired by my class demonstrations. I usually paint relatively small works along with my class themes to show the progress to the students, and give them opportunity to see every step of the actual painting. This year, I decided to make them a series of similar style of paintings, which is also part of my ongoing project of documentation of prairie and woodland plants. This March, I painted some non-native early spring flowers, because it has been unusually cold and there were no little flowers blooming in March!